As a South African, Zimbabwe is our neighbour. We have millions, yes millions, of displaced Zimbabweans trying to make a living in South Africa. At one stage our home affairs department gave asylum seekers a period of amnesty. I don’t think they can keep on top of the problem. South Africans have not always been kind to their neighbours. Sad stories of xenophobic attacks have been in our newspapers. 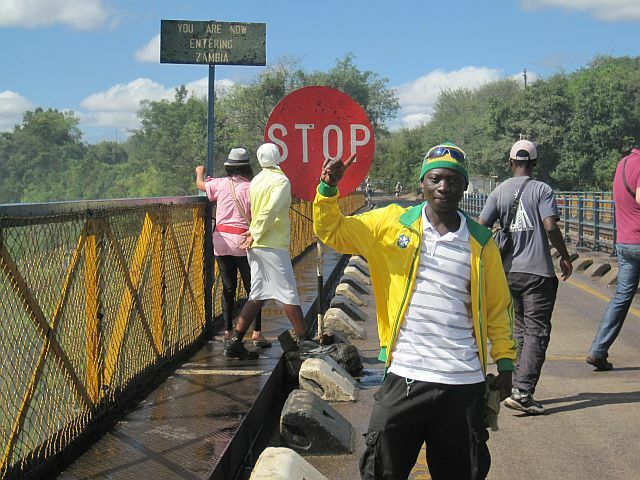 So it was with this in mind that I viewed Zimbabwe. I suppose I was expecting thin people in threadbare clothing wandering around with dejected looks on their faces. I have been to Zimbabwe before but that was a long time ago. It was a business conference and I flew in. The whole affair was lavish and we had a really good time. I do recall my boss was sick as a dog from anti malarials. I don’t take them. 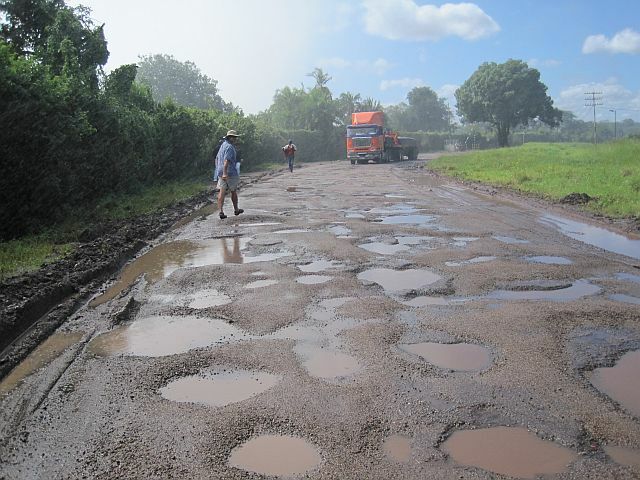 The roads in Zimbabwe were a bit tired and lacking in basic markings and signs. I did find it unfair that despite no speed limit signs the traffic police bolted out from behind a bush and flagged us down. Overall Zimbabwe was green and lush and I can see why it was once known as the fruit basket of Africa. 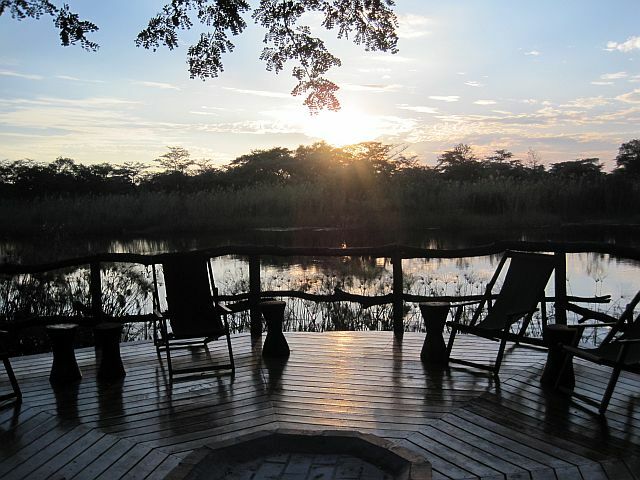 The people of Zimbabwe rival the Namibians for being thoroughly decent and friendly. They say the reason Robert Mugabe remains in power is that Zimbabweans are too nice to revolt against him. I would go with that. We got to our hotel, The Elephant Hills, a bit early. They allowed us to offload our luggage and have our lunch picnic on their grounds. The area was beautiful and the lawns were perfectly manicured. 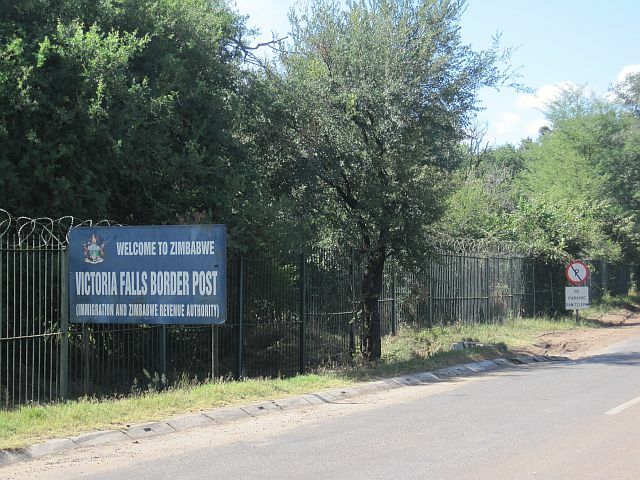 After lunch we headed off to see Victoria Falls. 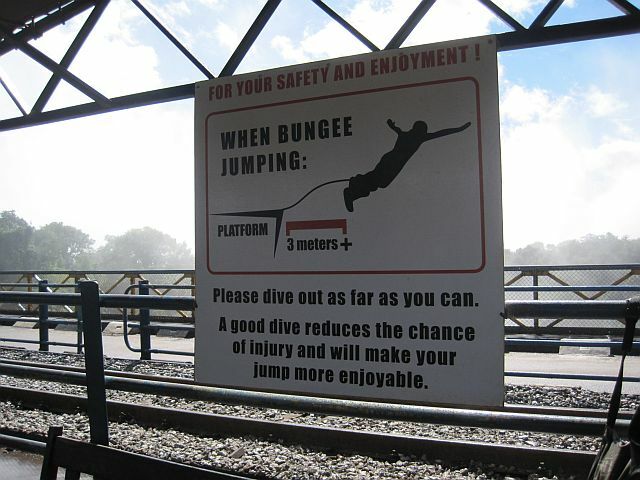 Other excursions on offer included a lion walk, a helicopter flip, bungee jumping and even river rafting. 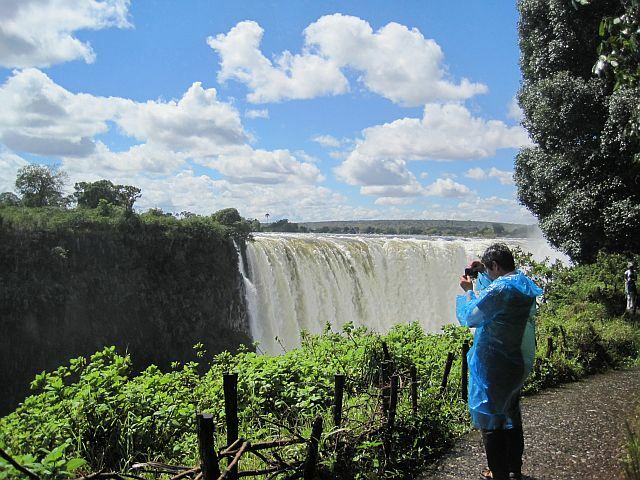 Vic Falls are the third largest in the world if you average out all the waterfalls with regard to height, width and volume. They were selling raincoats at the roadside stalls but I decided I didn’t need one. Mistake! The mist from the Vic Falls is like hard driving rain in parts. Thank God I had my camera, cell phone and passport in a waterproof pouch. I got soaked through to my skin. My clothes were dripping wet. There are crafters all over. You have to just say no to them or in seconds you will be over run with over eager traders. They haggle with you for the clothes off your back in exchange for wood and stone carvings. I took the bus from the hotel (free) and went to the big market where I found fabric, jewelry, wooden bowls and salad servers, table cloths and so much more. I swapped my old running shoes and some T-shirts for items. Our hotel was fantastic. My fears of not having toilet paper were unfounded. The chamber maid popped in to freshen the room a few times and they had fancy bottles of shampoo, bubble bath and whatever they put in rooms. No shortage of food either. The buffet was wall to wall. Stuff I don’t even see in South Africa. The service was excellent and the staff charming and so helpful. 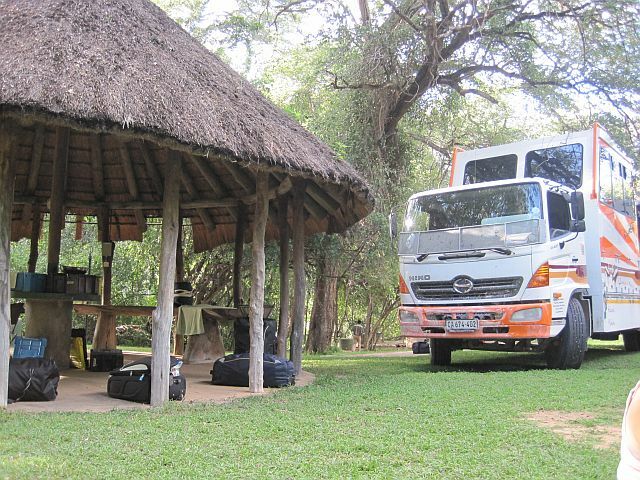 We had a morning lie in and after our fabulous breakfast we piled into our truck for the last time to head for Victoria Falls Airport. It’s not a big airport. Don’t bank on having lunch there. 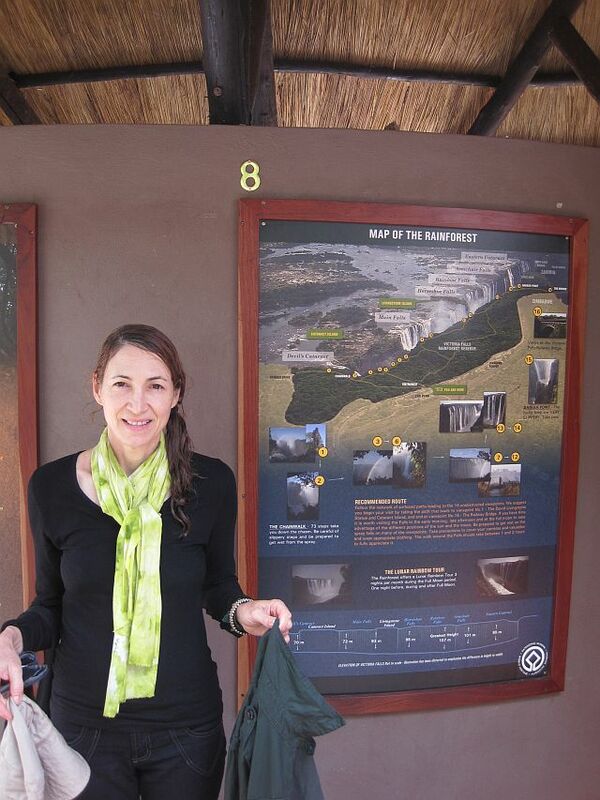 I flew to Johannesburg, our guide and her partner flew to Cape Town and the Germans all flew back to Germany. And just like that. Our holiday was over! Would I do it again? Hell yes. What would I do differently? I have to say, much as I really enjoyed camping, I enjoyed the nights we spent at a hotel or lodge. I relished having a long hot bath all to myself and not having to rush and queue for a shower. It was also great to have breakfast cooked and made and not having to do dishes and pack away. But I will also say this, I was very, very lucky with our guide, who is also a friend of mine. I ate well. She is an excellent cook and she loves cooking. In my case, she is open to vegetarian cooking. A rubbish cook could ruin a trip like this. Click here to go to Travel Archive page. Most people ask about your last holiday when you get home. I find more experienced travellers ask the most questions. Those who haven’t travelled much don’t really care much to hear about another destination. 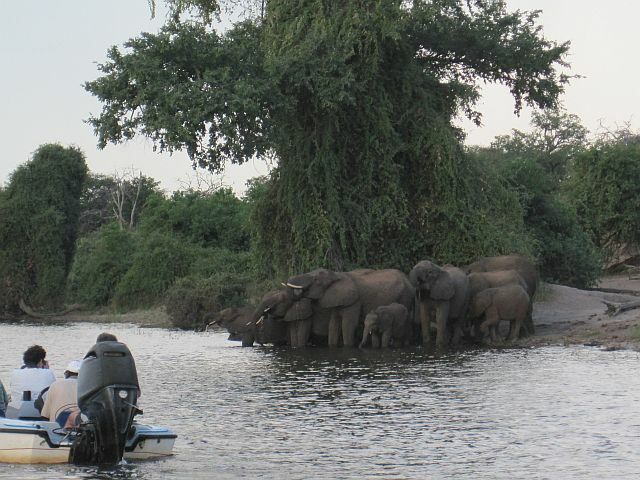 I am surprised at how many people have followed my Africa trip on this blog. Back to travelling. 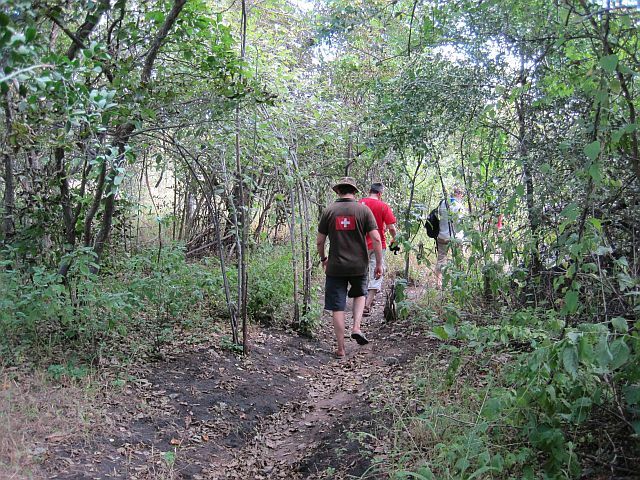 We had a not too early start as we set off to Kwando campsite. There was the usual frenzied rush to get breakfasted and showered before we got moving. 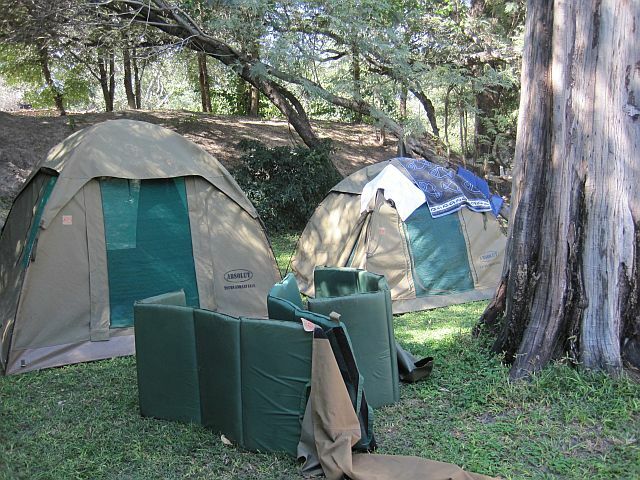 The journey to Kwando was short and we managed to erect our tents nice and early and have a relaxing afternoon. At Kwando camp, we were each presented with an indemnity form from the owners waiving the site of any liability if we were attacked by “wind and dangerous animals”. OK! 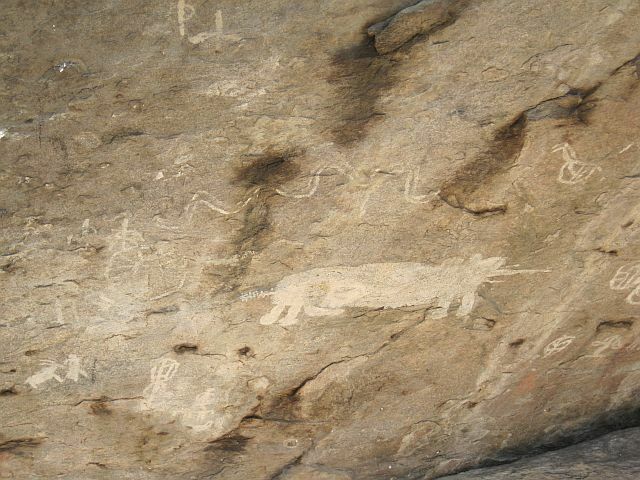 And there really were wild animals about. By now, the unmistakable sound of hippo grunting was ever present. 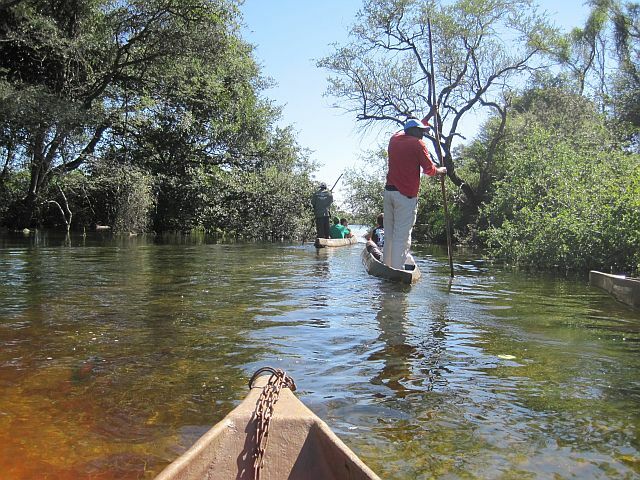 Fortunately during the day they stayed in the rivers so as not to get sunburned. I wasn’t about to have a swim anyway. There was a village tour on offer which most of the Germans took. I believe it was fun. The locals dressed up in traditional gear. They sang and danced and showed where they live. That sort of thing. Since I am South African and been on farms before, I have seen rural life. I chose to relax and get some washing done. We had a great evening relaxing around the fire. The food was consistently good. We got the lotto with our guide when it came to food. 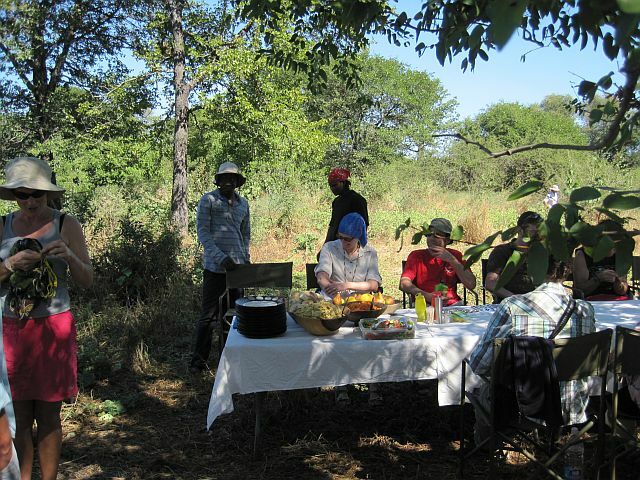 We also had to use up as much food as we could as it is forbidden to take certain foods into Botswana. 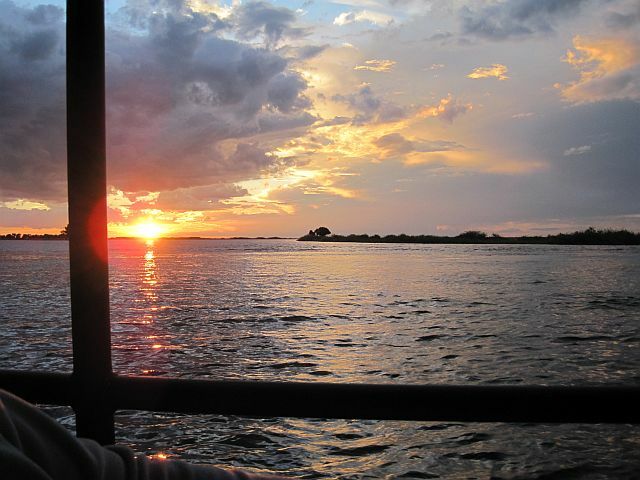 Our next destination was Chobe. En route we encountered the usual friendly police road blocks to check passports, driver’s licence, permits, that sort of thing. On the Namibian side, they were very easy going. 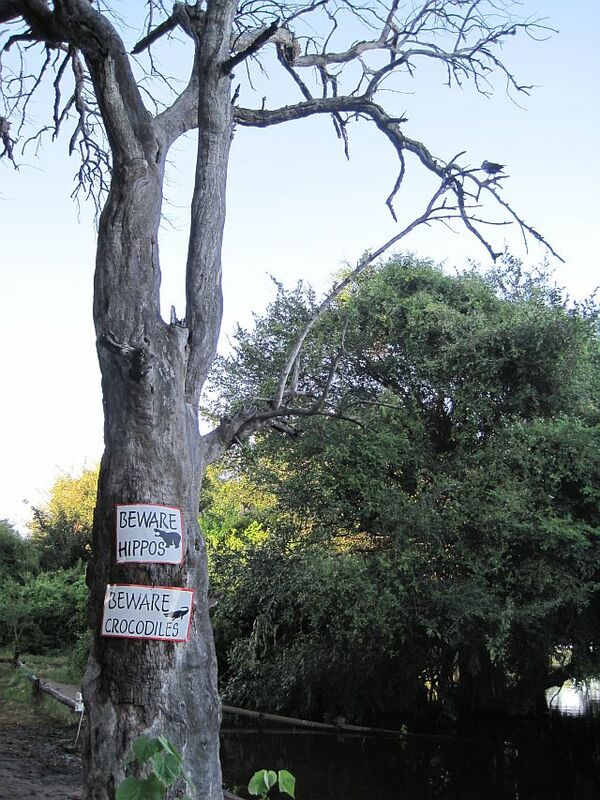 However, in Botswana, it got a whole lot trickier. Unbeknown to us tomatoes and cucumbers were on the “not allowed” list. Some heavy negotiating took place. 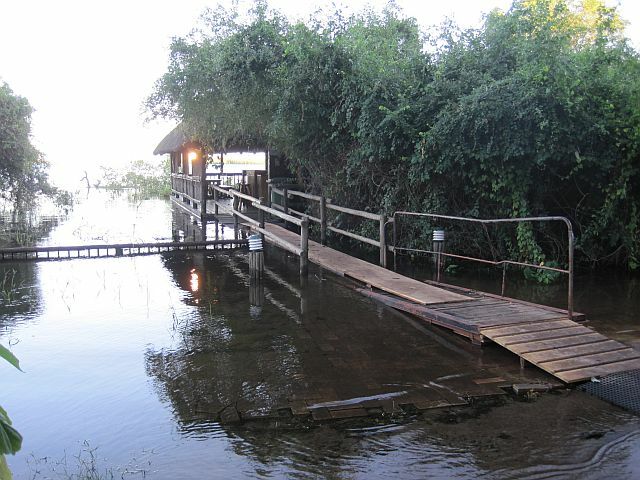 Chobe campsite was an absolutely amazing place. It was a mix of luxurious cabins and camping. That said, it was marred by a mix up with regard to our camping spot. I still don’t know what happened. We thought we booked a particular spot and a party of South Africans seemed to think they had booked there. A huge argument ensued and I am not proud to say I had a fair part in it. These Saffas would not leave the site despite it being patently obvious we were desperate to get set up so we could do a river cruise. All I can say is that I was so ashamed to be South African in front of the Germans. But the Germans also had a turn to hang their heads when we were at Victoria Falls airport. Some Germans casually shoved in front of us with no shame at all. Hey, you get them. Click here to go to second last piece – Part 9. We had our usual breakfast – muesli, fruit, yogurt, bread, cheeses, Nutella and preserves. The Germans took to Rooibos tea instead of regular tea. Rooibos tea is an institution in Southern Africa. We even have what they call a red cappuccino which is made from Rooibos. Yummy!! And of course we had to wash and pack everything away. The hyenas and monkeys will happily help themselves to all one’s food if one is not careful but we were on the move anyway. The sightings in Etosha were disappointing. The high rainfall meant the watering holes were hardly used as animals could get water anywhere really. 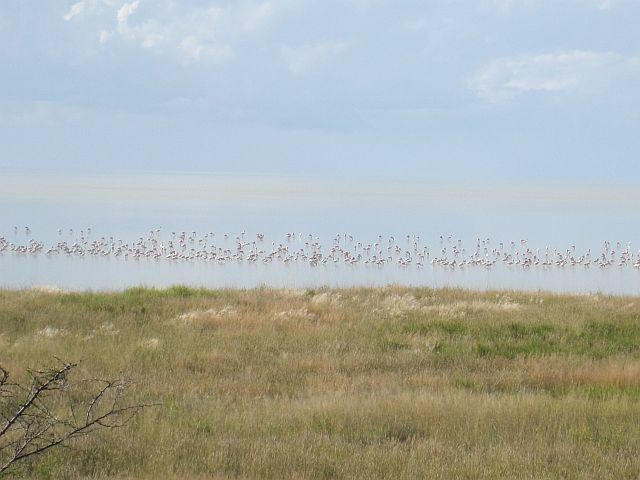 But what we did see, and only occurs during high rainfall, was flamingos. We saw lots of them. 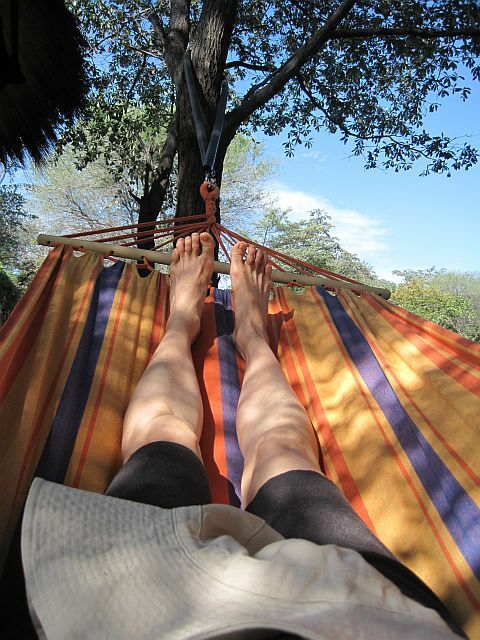 We spent two nights in Etosha National Park. One at Okaukeujo Camp and the other at Namatoni Bush Camp. When we were on the long open roads it felt like we had Namibia all to ourselves. But in the camps we soon discovered that actually, there were plenty people about. Buses heaving with humans were everywhere. The campsites were full. We did a lunch stop at Halali Camp. We often had left-over food for lunch, but the same two individuals in our group, single handedly devoured enough food for a platoon of soldiers the night before. Three helpings of food stacked up high, EACH! Our driver came late for supper and there was no food left for him. He ate at the restaurant. From Ethosha we did a shop up at Tsumeb and went past Grootfontein, an ex South African Defence Force base in the apartheid days. Namibia used to belong to South Africa and all young men were conscripted to the army for two years. It evoked memories for our driver and the South African guy on the tour. We passed through a good few road blocks. They usually checked for permits, drivers licences and the carrying of prohibited foods. I guess to prevent the spread of epidemics like foot and mouth. The Namibian authorities were super friendly. 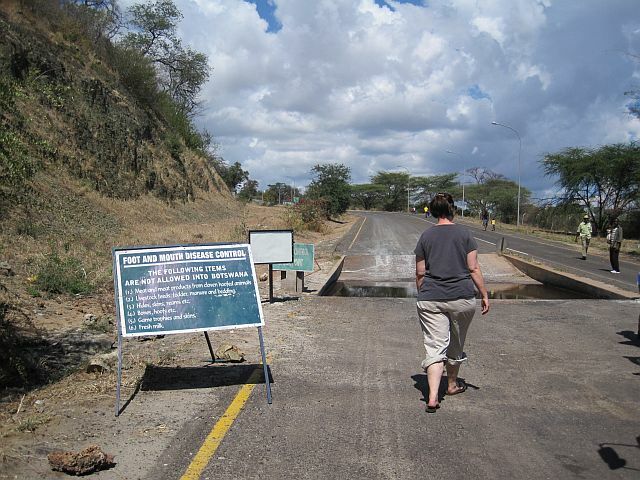 Less so in Botswana and in Zimbabwe they had speed traps, but no road signs giving us a clue to allowed speeds. Oh, and they hid away in the bushes and charged out to stop us in Zimbabwe. Not so nice! On we drove, now heading for Rundu. 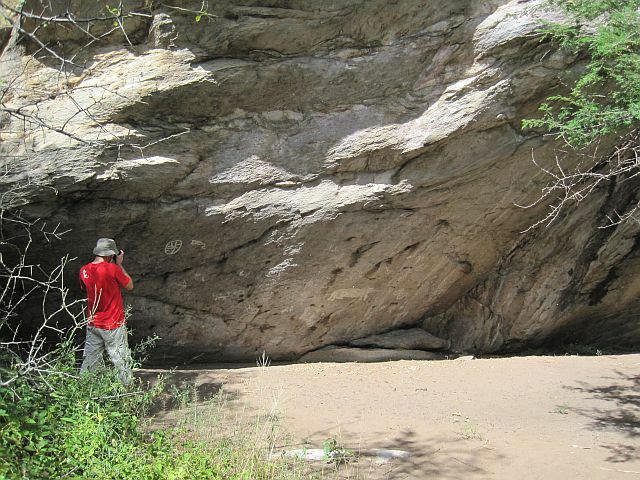 We had been warned that the campsite there had been inaccessible for quite some time, but was now open again. 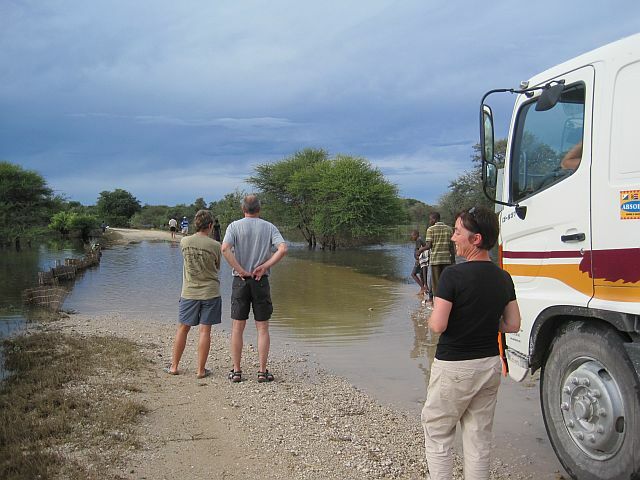 We all disembarked the bus and waded through the water on the roads. Our driver decided to go for it and drive through the river that had formed in the road. Had the sand been soft, he wouldn’t have risked it, but he felt the ground was firm enough to allow some traction on the tyres. 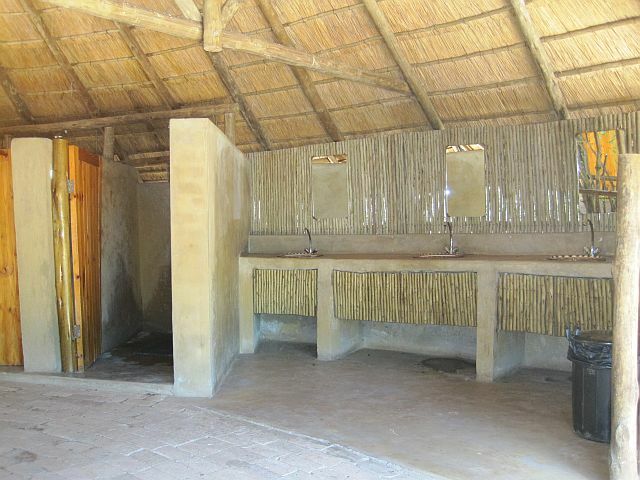 However on arrival, the consensus amongst the group was to upgrade to rooms, except for the two over eaters. The ground was still wet and I think we all just felt like a proper room for a change. Think – hot water on tap, no hauling gear on and off the truck, no damp tents, no wild animals lurking in the bushes. Aaah – heaven! Breakfast the next morning was no better than our usual DIY feast, but hey, no dishes and no dashing to the communal ablution facilities before the bus left. After that reprieve we all piled back into the truck and we now made our way toward the Popa Falls where we would stop next. This campsite was also under water but there were higher lying areas where we could pitch our tents.We needed to pitch our tents to dry them as they had been in the truck overnight. We got to Popa early and had the afternoon free. The Popa Falls are not that big. They are more like rapids. We couldn’t see them as the area was flooded. As much as we enjoyed our upgrade, it was great being back in nature. 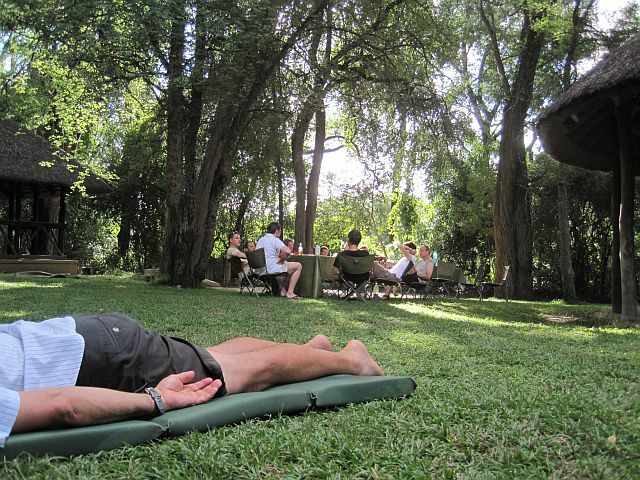 The sounds of birds in the trees, rapids rolling past nearby and the fresh air made us all lazy and we relaxed reading books or snoozing on the grass. Supper was marinated spare ribs and salad for the meat eaters. I had veg mince I brought along with salad. That night we got eaten alive by ants in our tents. 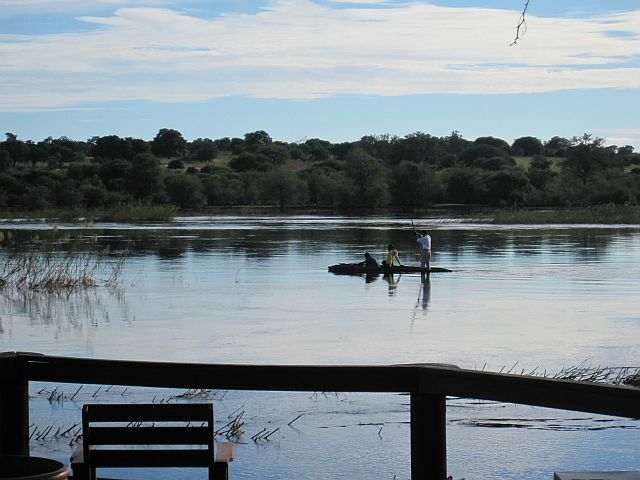 That was also the night we were woken by a hippo strolling between our tents munching grass. Hey, in the bush you have to take the rough with the smooth. That’s just how it is. Click here to go to Part 7.